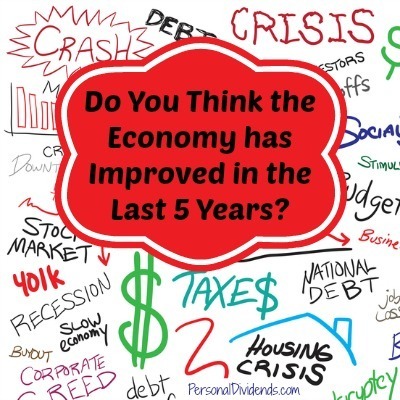 Do You Think the Economy has Improved in the Last 5 Years? It’s been about 5 years since the collapse of Lehman Brothers and the ensuing financial crisis and stock market crash. In the recession that was a part of the situation, many consumers changed their habits. In the last 5 years, the stock market has more than recovered, and the recession has ended. But that doesn’t mean that consumers are ready to acknowledge the changes. In fact, for many consumers, it still feels as though the economy is in poor shape. Whether the economy has improved is the subject of the latest COUNTRY Financial Security Index. For many consumers, the Great Recession represented the most dramatic financial downcycle in their lifetimes. While my grandparents vaguely remember the Great Depression, there are few events that ingrained themselves on the psyche like the Great Recession. Even my parents, who lived through the inflation of the 1970s and early 1980s feel that the Great Recession has left a stronger impression. According to the COUNTRY survey, about 49 percent of Americans feel as though the economy is worse than it was five years ago, while 19 percent say that it’s about the same. At the same time, 54 percent of respondents feel less financially secure. Only 27 percent feel as though their situations have improved in the last five years. The Great Recession has had such a lingering effect that people are still reacting as though the economy is still in the throes of a downcycle. In November 2008, 67 percent of respondents indicated that they felt as though the state of the economy required them to cut back on spending. That number is still high — currently at 68 percent. On top of that, many Americans feel as though they are still recovering from the ravages of the economy. According to 41 percent of respondents, they are still recovering from the impact of the recession, while 19 percent feel as though they will never be able to recover from the financial impact of the Great Recession. The shift in the psyche can be seen somewhat in the shift in recent years toward frugality, and the fact that instead of being proud of new cars and big homes and consumer items, there is a pride in pinching pennies and getting the best deal. The COUNTRY Financial Security Index also takes a look at how Americans view the future. Many Americans are so pessimistic about the future. Only 38 percent feel as though they will be in a better position five years from now, while 21 percent say things will be about the same, and 28 percent think that things will get worse. On top of that 46 percent of respondents feel that another recession is coming in the next five years. Clearly, there are plenty of folks who are still considered about what’s next for the economy — especially since many feel as though they are still in a precarious financial position. What do you think? How are your finances compared with five years ago? What do you think the next five years hold? undoubtedly the economy is vastly improved – but the man on the street is usually the last to feel it.